Welder glue is one of the best EPP to EPP adhesives we have found. It is perfect for making hinges on all SuperFly RC aircraft. 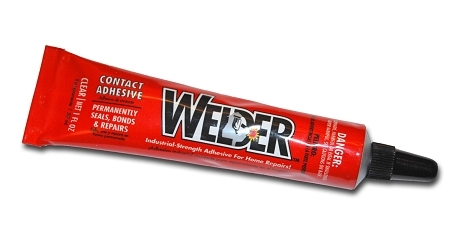 This item is a single 1oz tube of Welder Adhesive. Welder is a clear, industrial strength all-purpose adhesive that bonds porous and non-porous materials together in both outdoor and indoor applications. Welder can be used on plastic, wood, metal, rubber, vinyl, cloth, tile, ceramic, glass, Formica®, cement, brick and more. Welder permanently bonds, fastens, protects, seals, and caulks thousands of everyday items. It mends toys, ceramics, vases, pottery, and is useful for craft areas. It is an ideal permanent repair adhesive for sporting goods, tools, plastic caps and housings, broken light fixtures and hoses. Use it on bicycles, appliance seals, chair and table legs, and to re-affix emblems and house numbers. If your order contains ORM-D consumer commodities (Welder Glue) ORMD commodities cannot be shipped to Canada and the U.S. Territories. Since the U.S. Postal Service considers Priority Mail as air, ORM-D commodities cannot be shipped via the Priority and must go Parcel Post. Since we do not make split shipments, we recommend that you place all ORM-D consumer commodity items on a separate order to ensure faster shipping of your items, unless you are willing to allow the entire order to go Parcel post. Why do other hobby shops and dealers ship ORM-D items by air and you do not? In order to ship items considered to be hazardous materials by air, including ORM-D Consumer Commodity items, the shipper must be licensed as a hazardous materials shipper, with special on-going staff training in the shipping of hazardous materials. Most coin supply dealers, and other small companies like ourselves, do not have a hazardous materials shipping license. While some dealers choose to risk consumer safety by not complying with the requirement, we are committed to the safety of our carriers and the public at large. Additionally, fines can exceed $100,000 per incident. Liability can be civil or criminal and personal or corporate in nature. What does the ORM-D Designtion Mean? ORM-D is a designation assigned by the U.S. Department of transportation to note a small amount of material that can be considered a hazardous substance, but packaged in a form intended or suitable for retail sale. Often, the material may be mildly hazardous, but when combined with other hazardous substances, it may represent a significant risk. A simple example is a can of compressed air. Often when cans of compressed air are shipped by airplane, because of the reduced atmospheric pressure resulting from flying at high altitudes, the can of compressed air will explode. While an exploding can of compressed air may not present a significant danger in itself, it can pose a great danger if it explodes in proximity to other volatile products. Why can't ORM-D items ship by air and only ship by surface? Due to the potential for a catastrophic event as a result of pressures at high altitudes, and the fact that some air shipments travel in cargo holds of planes that also carry passengers, the U.S. Department of Transportation bans the shipment of any hazardous materials, including ORM-D Consumer Commodities from traveling any way other than suface transportation (truck, train or cargo ship). Will you ship ORM-D items to non-U.S. Destinations? No. Since U.S.P.S. Priority Mail, FedEx and UPS all carry international shipments as air freight, ORM-D items cannot be shipped outside of the U.S. I love this glue! I use it in place of superglue because it's so much easier to work with without sticking your fingers together, and it works with almost everything with no bad odor. My husband had it for hobbies, but if I need glue, I use Welder's. I've yet to find something that it won't stick..Ceramics, shoe leather, sunglasses, iPhone case. It's great!